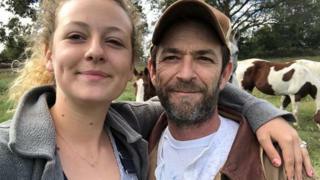 The daughter of late Riverdale actor Luke Perry has hit back at people who have criticised her grieving process. Sophie Perry explained on Instagram how she’s “received a lot of attention online” following her father’s death. “Yes I am hurt and sad and crying and beside myself with what happened to my dad,” she wrote. “But I’m not going to sit in my room and cry day in and day out until the internet has deemed it appropriate for me to do otherwise,” she continued. The US actor died in California at the age of 52, less than a week after suffering a massive stroke. Perry rose to fame for playing Dylan McKay in Beverly Hills, 90210 and gained a new generation of fans through his role as Fred Andrews on Netflix’s Riverdale. His 18-year-old daughter also said she “did not ask for this attention” and would not “cater to any one else’s needs and beliefs”. Sophie Perry was in Malawi shortly before her father’s death and “made it back just in time” to be with her family. A few days after mourning her father on Instagram, Sophie praised her mum Minnie Sharp on International Women’s Day. She called her mother “the rock for everybody grieving in this family” and “the toughest and sweetest and most amazing woman”. Sharp, who played Emily in 1987 film Teen Wolf Too, married the Riverdale actor in 1993. They had two children, Jack and Sophie, and separated in 2003.